A symbol of hope and solidarity for generations of Northwestern’s Black Community. On Friday, Nov. 13, days after protests and racist threats flared up on the University of Missouri campus, about 20 Black students at Northwestern met at the Black House. They had decided a few days earlier that they wanted to stand in solidarity and advertised their action over a Facebook event page, where over 1,100 expressed interest in attending. “I looked out the window and there were a ton of people standing outside,” SESP sophomore Michelle Sanders says. The porch of the house quickly turned into a platform for voicing Black students’ frustrations. As momentum picked up, the gathering, about 300 strong, marched up Sheridan Road to Technological Institute. 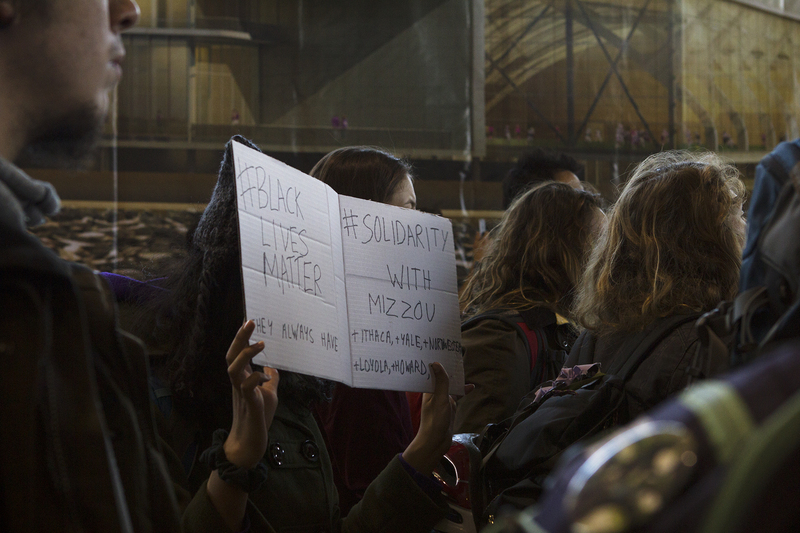 Although prompted by the events in Missouri, they marched for more than Mizzou. They marched for Northwestern, for Black students everywhere, for Black lives everywhere. Communication sophomore Sarayah Wright, who was part of the march, described it as both raw and thoughtful. Black cis, queer and trans women as well as femmes (those who do not necessarily identify as women but whose gender presentation leans toward femininity) were called to the front. “Those people are often erased,” she says. Chanting slogans like “Mama, Mama, can’t you see, what Northwestern’s done to me,” students gathered in front of Tech before continuing to the Henry Crown Sports Pavilion, where a groundbreaking ceremony was taking place for a $260 million sports complex. To the protesters, the ceremony demonstrated a lack of resolve by administrators to address issues that were important to them, pointing out the disconnect between which buildings the University chooses to renovate and which they do not. “We could tell where the administration’s priorities were,” Wright says. Students stood outside curtains that walled off the ceremony, directing their demands at President Morton Schapiro in an effort to disrupt the event. After shouting their demands, attracting the attention of national sports media covering the ceremony, the protesters left, chanting, “You can’t stop the revolution.” They concluded their march outside by forming a healing circle, joining together to express support for each other. The history of Black activism is long at Northwestern – some students feel that their very presence here is resistance. “Every breath we take is an act of liberation,” Wright says. The door for that existence was opened in 1883, when the first Black student was accepted to Northwestern, but a strict system of racial quotas limited numbers until the mid 1960s. Between 1965 and 1967, the number of Black freshmen registered at NU rose from five to 70. By the spring of 1968, there were about 160 Black students on a campus of 9,000 graduate and undergraduate students. Facing failed promises of integration into campus life and hostile interaction with white students, For Members Only (FMO) and the Afro American Students Association, the representative organizations for Black undergraduate and graduate students, called for a voice in decisions being made about them. In April of that year, they sent a list of demands to the University administration. The University refused to yield power to them, and on May 2, members of the administration invited students to discuss their concerns. Students had something else in mind. The next morning, about 100 Black students entered the Bursar’s Office, the University’s financial administrative office at 619 Clark St. They chained the doors and participated in a sit-in. Over the course of two days, the students and administration underwent negotiations. Students walked out the next evening having effectively pressured the administration to acknowledge the history of white racism at the University; create Black student committees to advise on financial aid and recruitment; provide separate housing facilities; and promise to set aside a recreational space on campus – the first step towards founding the Black House. On Oct. 10, 1968, the vice president of student affairs released an implementation report on the Black Student Agreement that followed the sit-in. Included was the repurposing of 619 Emerson St. to include activity facilities, FMO meeting space, a library and study room, conference rooms, an informal lounge and a counselor. This space would come to be known as the Black House, and in 1973 it moved to its current location at 1914 Sheridan Road. The fight to establish and maintain that space, however, has influenced the collective memory and sentiment surrounding the space. “It was meant to be a Black student union, a space to gather, but because of the ways in which it was fought for and how public that space is, it also serves as a symbol for the fight for equity and justice on campus,” says Lesley-Ann Brown-Henderson, Executive Director of Campus Inclusion and Community. That history is not just one of progress to be celebrated but also one of violence that must be acknowledged. Creating physical resources on campus was not enough to remedy a history of racism that was embedded in the culture of higher education where white students were often openly hostile to students of color. Although this kind of blatant racial violence is less common now, Cole Dillon says the basic systems and implications are the same. “This sense of entitlement, that ‘you are here at our grace,’ it has lessened, but it hasn’t gone away,” she says. Northwestern’s Black House therefore stands not only as a site for activism on domestic and international issues but also as a salient symbol worth defending in and of itself – a symbol of cultural resistance and resilience. As the 50th anniversary landmark approaches, perhaps the greatest tribute, as well as reminder of how far the University still has to go, is the ongoing action of students on campus. This past August, as part of its restructuring, CIC announced changes to the Black House and the Multicultural Center to renovate certain areas, move in staff offices and consolidate student group spaces. CIC had recently expanded to include Multicultural Student Affairs, Social Justice Education and Student Enrichment Services. In an effort to consolidate the staff of these departments, Brown-Henderson says co-locating in one or two spaces would help them stay in contact and hear the experiences of students first hand. With budgets allocated on a September to September fiscal year, Kellom says a significant portion was saved up by the summer, the end of the budgeting year, presenting them with the opportunity to pursue the alterations. But for students and community members, the timing felt like an opportune moment to circumvent them while they weren’t on campus. The process represented a typical approach that systematically overlooked them. Black students and alumni held a conference call the day after the changes were announced. Kellom, who became director of MSA less than a month before the changes were announced, says they made an effort to vet the ideas and inform the community, but not many students participated in the Google Hangouts held on the proposed changes. Given the response to the proposed changes, Kellom hopes to implement a more effective institutional system for students to provide feedback to MSA. There is a history of administration overlooking the needs of marginalized students, says Brown-Henderson. Although she understands the sentiment, she says their intentions were incorrectly perceived as malicious. “What we’re saying is trust us,” she says. “I’ve tried my best to push forward our equity and inclusion. Some of that has been behind closed doors where no one sees, but it’s clearing the pathways for students to be able to express themselves,” adding that much of the work she and her office does is aimed at creating incremental systemic change. And they did, taking to social media channels to decry the alterations, which they felt prioritized administrative duties over student experience. Four days after the announcement, MSA decided to suspend the planned changes and organized four listening sessions for Fall Quarter to be followed up by a Black House Facilities Review Committee made up of students, faculty, staff and alumni. But these sessions fell short for many students. “No amount of coats of paint on the walls will fix the institutional racism,” she says. Cole Dillon, who represents Black alumni on the review committee, says she is hopeful the recommendations will come from an organic place, but she recognizes the University has no obligation to accept the suggestions. For students who use the space, it clearly is not any other administrative building. In an effort to follow through with their action in November and in response to the University’s proposed changes, students released a set of demands, just like their predecessors had almost 50 years ago, to improve the climate on campus for Black students and other marginalized groups. One portion of these demands focused on physical campus spaces like the Black House, calling for updates to software in the computer lab and more resources for STEM students of color. But the demands go beyond surface level changes, and students and staff agree that is necessary to more effectively improve Black student life. Sanders, who has been closely involved with the accumulation and writing of the demands, says they haven’t limited themselves in scope. Their goal is to express sincere demands without concern for what administration considers realistic and unrealistic. After a wide-scale campaign of emailing the list to President Schapiro on Black Friday, students heard back in December. In an email co-signed by Schapiro, Provost Dan Linzer, Vice President of Student Affairs Patricia Telles-Irvin, Executive Vice President Nim Chinniah and Associate Provost for Diversity and Inclusion Jabbar Bennett, students were asked to select five or six representatives to meet with the administrators in January, again bearing resemblance to the events of 1968. On Jan. 7, Black Lives Matter NU hosted a townhall for concerned students to share their own ideas and collaborate across a wide range of communities to make the demands as comprehensive as possible before they were taken to the administration. The Weinberg senior says about 10 students came to the meeting with the five administrators. 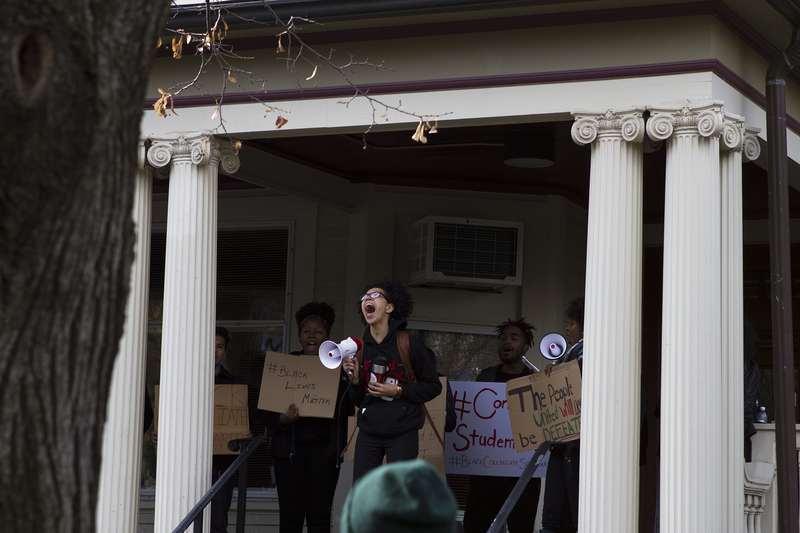 Held on Jan. 19 in the Black House, students gave the administrators an updated list of demands; asked for monthly follow up accountability meetings and a website to detail concrete progress on the demands; and used the space as an opportunity to air grievances. “We wanted to control the space in the sense that student voices would be prioritized and not just administrators telling us what they accomplished,” Godslaw says. Khaled Ismail, a graduate assistant in MSA, says staff and students in multicultural offices play a large role in influencing change from within administrative structures of higher education, which doesn’t naturally recognize inequity. For Brown-Henderson, that work is pressing but takes persistence. Through her work, Brown-Henderson strives to fundamentally change the experience of students of color. That work involves going beyond facilities updates and construction of student spaces. The student demands go beyond these surface level improvements, and their authors hope to elicit a serious response from the University administration. It is in the midst of this current environment that the Black House offers a form of refuge to Black students. For Royal, seeing the Black House during her first visit to Northwestern was instrumental in her decision to attend. Although the House serves as a shelter for students like Royal, she takes issue with discussion surrounding safe spaces. Schapiro declined to comment on the article, saying his views on safe spaces were clear. At the end of the day, students are asking why the only safe places for them are pinpointed and the responsibility is theirs to protect those spaces rather than the University’s as a whole to improve. While recent campus activism has focused on the Black House as a historic place of refuge worth defending, Royal doesn’t want that to belie the larger issue, which is institutional. One of the causes of concern with the proposed changes in August was the further consolidation of spaces for students of color. Four cultural student groups would share the top floor of the Multicultural Center under the planned adjustments to open up more offices. This lumping of marginalized identities is historically institutionalized, and that process has occurred on Northwestern’s campus as well. Cole Dillon describes how the United States was a Black-white duality until the 1970s and 80s, when other ethnicities began to come with their own needs. In an effort to resist that erasure, the Black House acquired another role – preserving culture. Traditionally that has meant facilitating student-faculty interaction and hosting significant members of the Black community and jazz and blues musicians. More than just a resource center or student union, the house is a place where they can learn from upperclassmen, learn about a complicated history and culture or simply engage in recreational activities. “I’m all about creating a safe space for people to talk, but I’m also a strong proponent of a brave space, where you feel compelled to participate and act,” Royal says. For many Black students, the Black House is a centerpoint for student life in all that that entails; labeling it as a safe space essentializes what takes place there. The Black House fosters bonds between those who frequent its halls. Ismail, whose office is also in the house, says it also ties its present-day community to the generations that laid its foundations and passed through the space. The house has withstood the test of time, its walls held up by the never-ending work of students who have carved out a space for themselves on a campus that, for so many of them, has only attempted to erase their history, identity and experience. The effort students put into creating and preserving the Black House reverberates through the space, a structure that has come to embody the struggle of Black students to simply exist. This article was updated to reflect that President Schapiro declined to comment on the article, and differs from the version that was printed in the magazine. In the print version of this story, Lesley-Ann Brown-Henderson was mischaracterized as saying "underprivileged students," and it has been changed to "marginalized students" online. NBN regrets this error. NBN's live coverage of the November 2015 demonstration stretching from the Black House to Henry Crown Sports Pavilion. Kori Alston was frustrated with his own identity and with how those identities played out in America. So he wrote about them.